I had the amazing opportunity to attend a pre-screening of the movie, The Horse Boy. It is the true story of a Texas couple and their son’s journey on horseback through Outer Mongolia in an attempt to heal their son’s autism. Rupert Isaacson, a writer and former horse trainer, and his wife, Kristin Neff, a psychology professor, sought help for their son, Rowan, who was diagnosed with autism at the age of two. They went to numerous doctors and tried many medications, but all traditional therapies and medications had little effect on Rowan. They discovered that throughout Rowan’s tantrums, many of which could last as long as four hours, that the one thing that helped Rowan remain calm was when he was with horses. Rowan had a natural affinity to animals and he could poke and prod the animals and their response would be a gentle, quiet stillness. Rupert and his wife discussed bringing Rowan to shamans in Mongolia for healing. Rupert had worked with shamans before through his work as a journalist in Africa. He thought if he could bring Rowan to healers who would work with him and experience their horses, this could possibly bring about a cure. The movie revealed a profound insight into the world of the autistic mind. It showed the courage of parents who traveled half way around the world for their child – only to wonder at various points if the trip was really for Rowan or for them. The movie showed the vulnerability of parents and the everyday uphill battles of living with an autistic child. Rowan gave all autistic children a voice of hope and love. I sat through the first 30 minutes of this movie crying. I was crying for a little boy who had no way of expressing himself except long screaming tantrums. I was crying for the parents who were doing everything they could to help alleviate the suffering of their son. I was crying for family and friends who have been through their own journey with autism. At the very end of the night, Isaacson spoke to the audience and told us what he was able to learn from this experience. He told us he didn’t want a cure for autism. He wants healing. Isaacson said that he doesn’t want his son to suffer, but that he wants him to keep his personality – that is what makes him special. This really is a remarkable film about a family’s extraordinary journey, adventure, shamanic and human experiences. Most of all, it is a story of love. 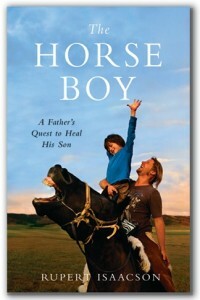 If you are unable to see the movie, I encourage everyone to go and purchase the book, The Horse Boy. This is dedicated to Rupert Isaacson, Kristin Neff, and Rowan for sharing their remarkable story as a testimony of courage and love as well as to the shamans throughout the world – seeking to direct­­ love and consequently healing. This is also, dedicated to the many families who seek healing for their autistic family members.